Some form of the phrase, “Peace Be With You” is used by almost every religion as a greeting and expression of fellowship. By putting it around a rosette of six different religious symbols, it invites individuals of all religions to come together in fellowship and worship of the Divine Spirit which created and unites us all. Peace be with you interfaith Button says “Peace Be with You” around our multi-faith rosette with six religious symbols. 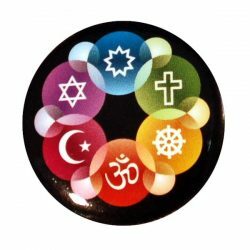 Wearing this button is a good way to let the people you meet and work with know that you are supportive of all faith traditions. It helps people feel at ease knowing that, even if you are of a different faith, you respect theirs. This matches our interfaith stickers. A similar button is available in the 1″ size for giving out at events. For more reserved work environments, we recommend our lapel pins.